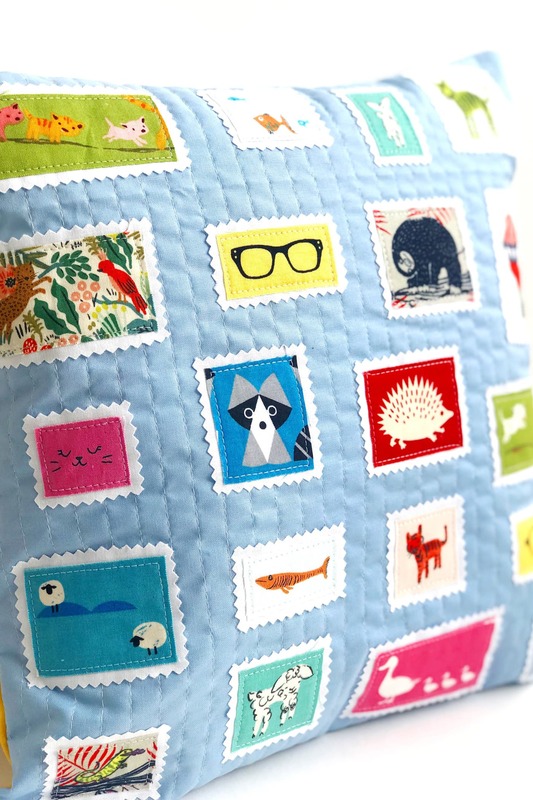 This adorable Postage Stamp Quilted Pillow tutorial is the brainchild of Sarah Ashford. 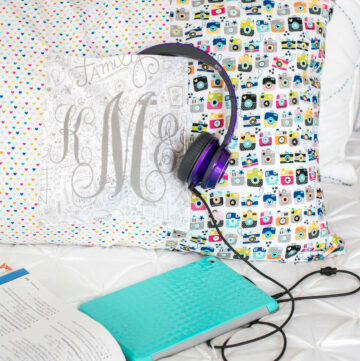 I’m so excited that she decided to share the tutorial for this amazing pillow with you guys today! 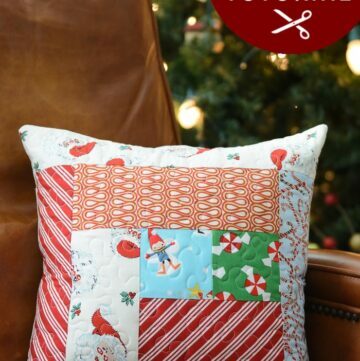 It’s the perfect project to use up some of those fabric scraps that you’ve been hoarding! You may have seen a few weeks ago my rainbow bunting tutorial (link) that featured a whole host of delightful little animals. 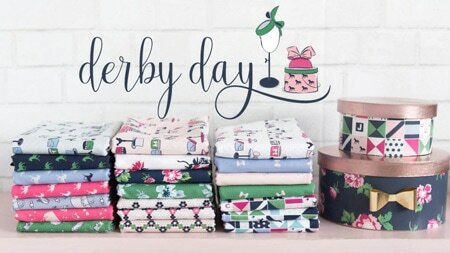 Well, it got me thinking that some of those fabrics were just so perfect for fussy cutting, and it gave me an idea. 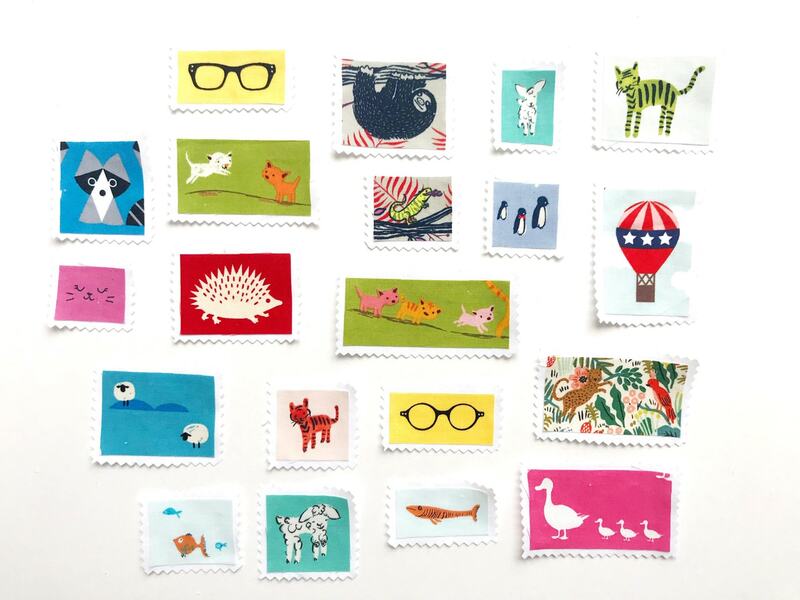 I just love those projects with little fussy cut postage stamps on them, they are just the cutest! 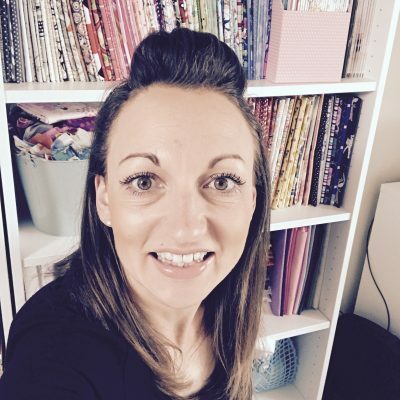 So I decided to fussy cut some of my rainbow fabrics and I delved into my stash to see what other cute creatures I could find to add to the gang. 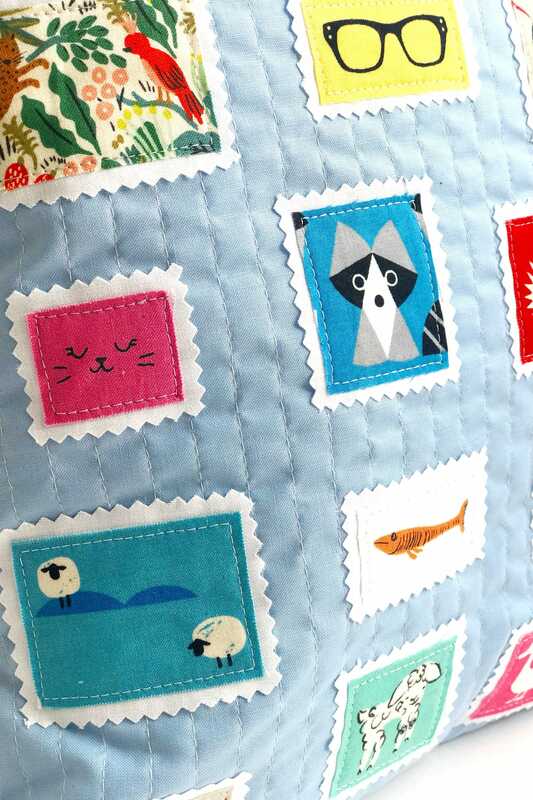 The result is this gorgeous postage stamp cushion! 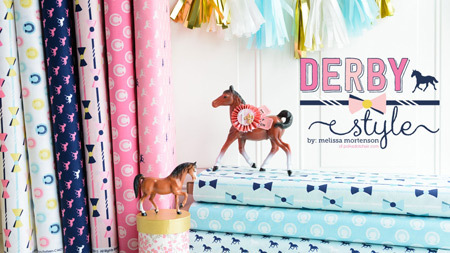 There’s no better way to show off your favorite novelty print animals with a bit of fussy cutting. 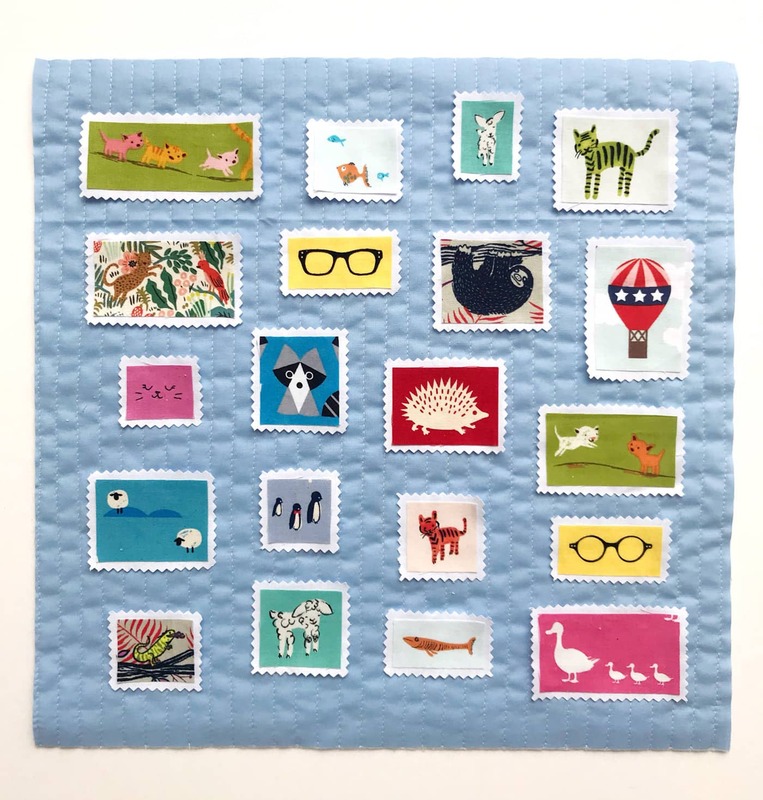 So why don’t you have a rummage in your own stash to see who is lurking, waiting to be center of attention on your very own postage stamp cushion? First of all, you need to make the stamps. 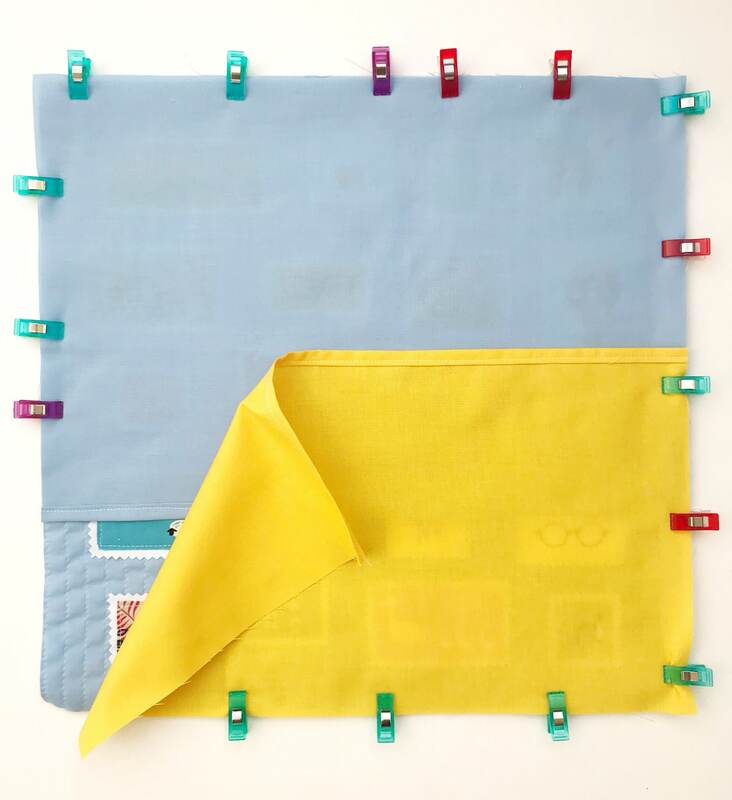 Take your fabrics for fussy cutting and trim into a square or rectangle depending on the shape for each motif. Use a rotary cutter and ruler for this to ensure you get straight lines and 90-degree angles. How many you need will depend on the size of each motif. Make lots so you can play around with the layout, and choose your favorites. 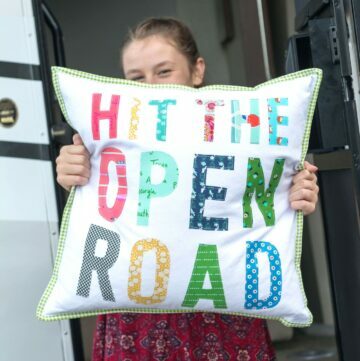 You can always add one to the back of the cushion or gift any spares to a friend! Once all your motifs are cut out, take one at a time and use a glue pen to stick the motif onto a larger piece of white fabric. 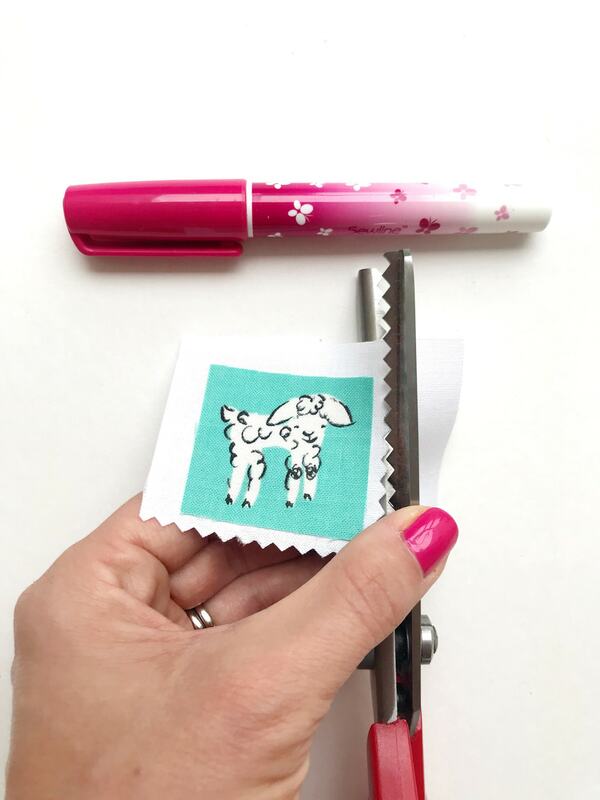 Use pinking shears to cut out close to the edge. Don’t worry, these stamps will be stitched together later on! The glue is just to hold things in place for now. Do you like how my nail varnish matches perfectly with my glue pen?! I’d like to say it was intentional! Repeat for all of the motifs and set aside. Take your background solid fabric and use spray baste to adhere it to the batting. 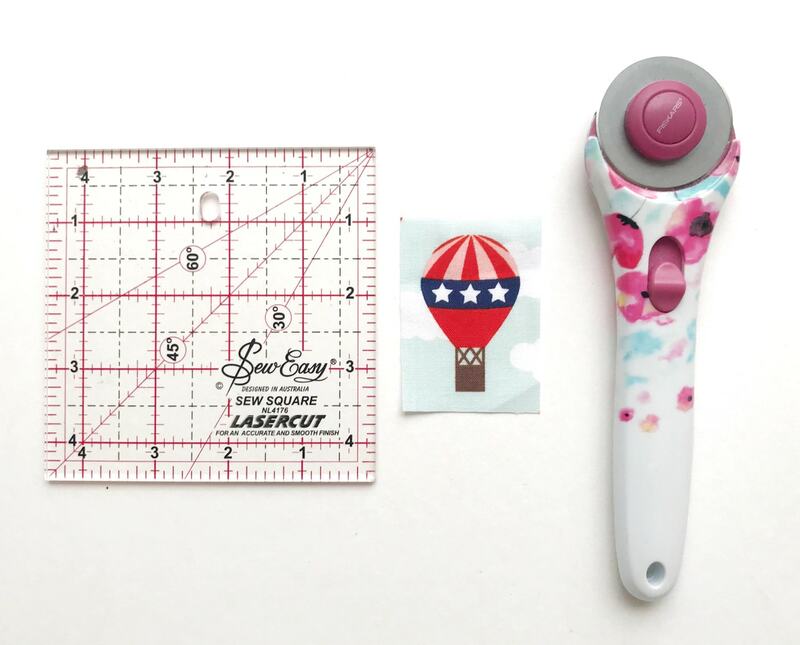 Use a hera marker and a ruler to draw a straight line down the center. Quilt down this line then use this line as a guide to quilt either side of the line at approximately 1/2” intervals. Trim the batting to the size of the background fabric. Now for the auditions! 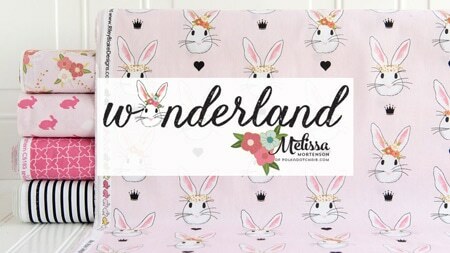 Play around with the layout of your stamps on the background fabric, balancing size, color and motif type. 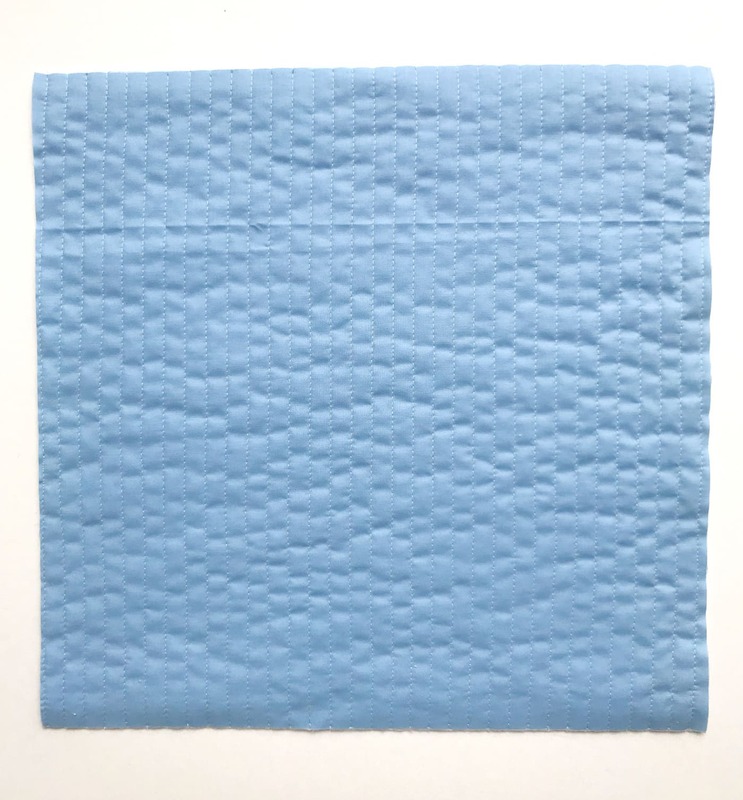 Don’t place them too close to the edge as you’re going to be using a1/2” seam allowance all around when you stitch the front panel to the back panels later on. Once you are happy with the layout, take a photo – just in case! 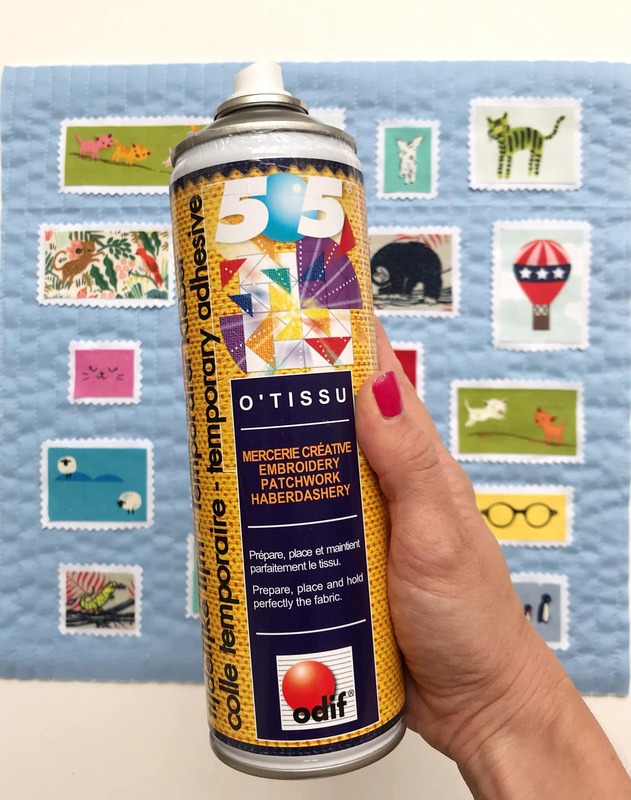 Once you are happy with the layout, take the spray baste, and in a well-ventilated area spray onto the back of each stamp and press into position. After all the stamps are in place, iron the cushion front to further activate the adhesive. This will ensure that none of the stamps move when you come to the next step. 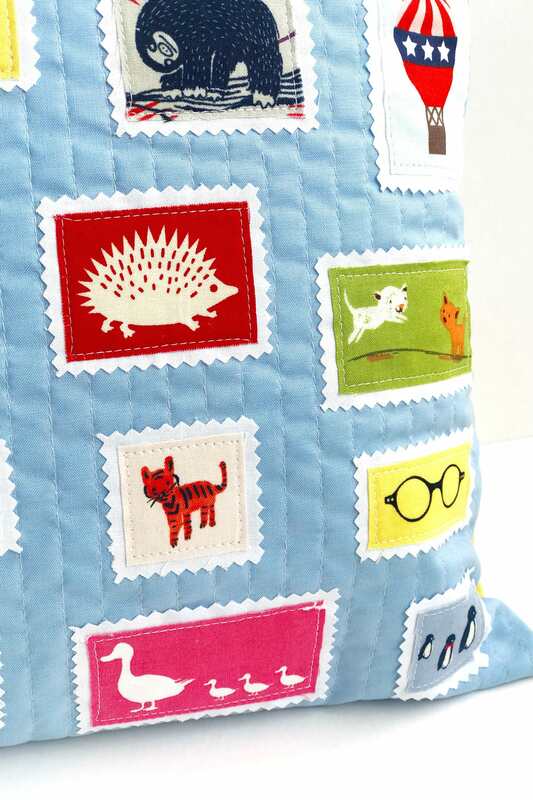 The next thing to do is to appliqué the stamps. Carefully stitch a few millimeters in from the edge of each motif, all the way around the edge of each stamp. 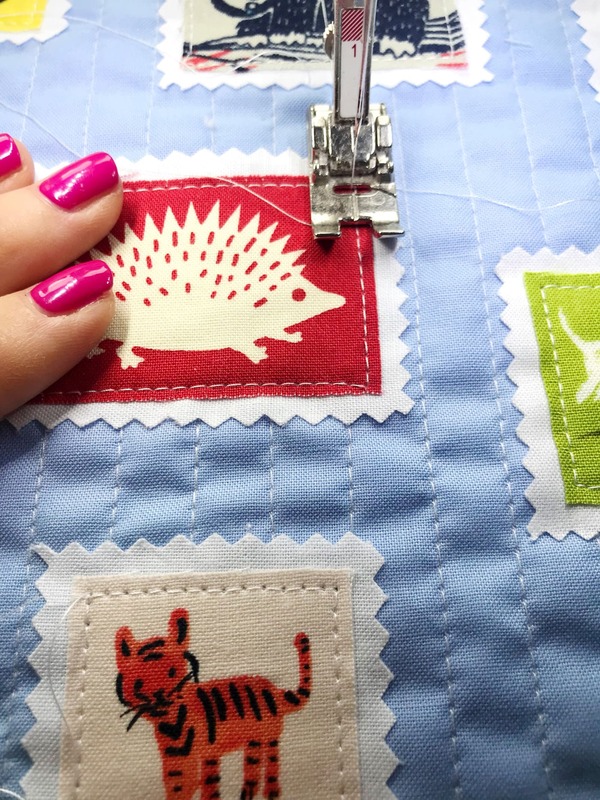 Stitch all the stamps then pull the threads to the back and tie off. Next is the envelope back. Take the top blue panel and fold 1/4” and then 1/4” again and pin in place to create the hem. Repeat for the bottom yellow panel. Stitch along the hemline to secure in place. Now to construct the cushion. 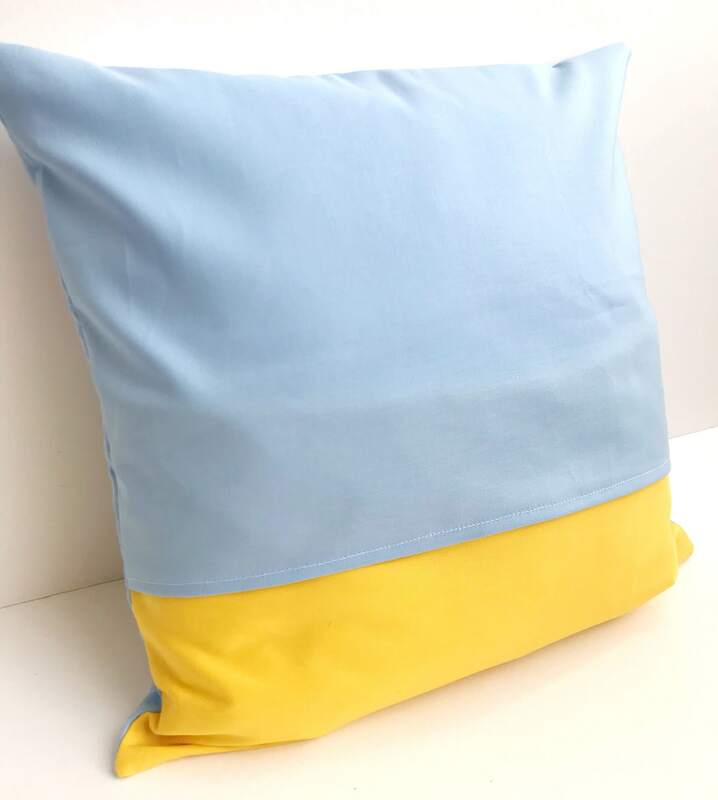 Lay the front of the cushion face up and the top blue panel right side down with the hem in the middle. 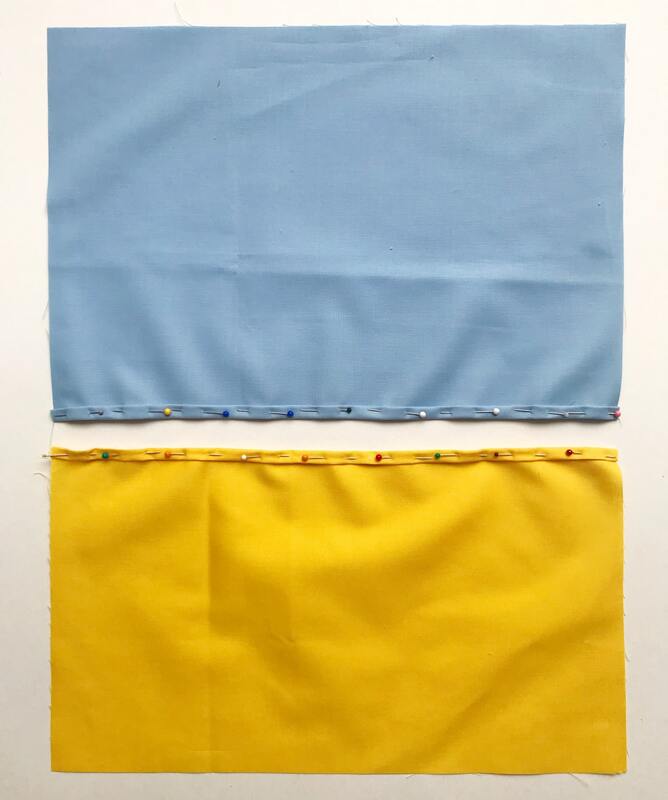 Lay the bottom yellow panel across the bottom, again with the hem in the middle. Use binding clips to hold in place. Stitch all the way around with a 1/2” seam. Clip the corners and turn right side out. Insert your cushion pad and you are done! 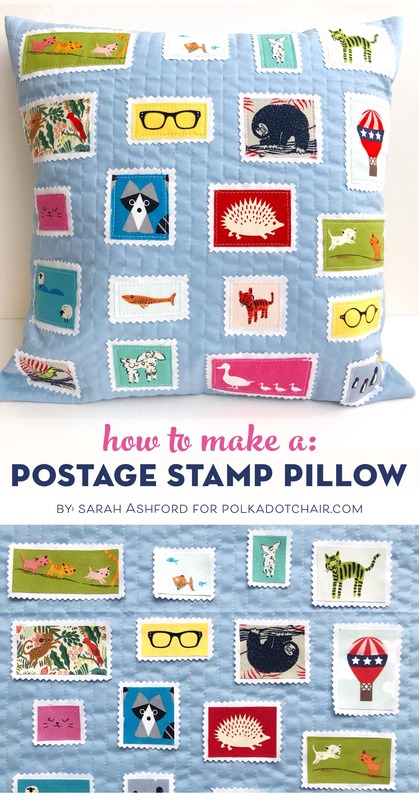 Hi thank you so much for the cushion with the postage stamps I will definitely give it a go a really good idea I will make one each for my granddaughters they will love it.Looking at the different pictures. Do you not worry about the edges of the Stamps fraying? I was thinking about the fraying also. Should it be backed by heat n bond or something else similar? 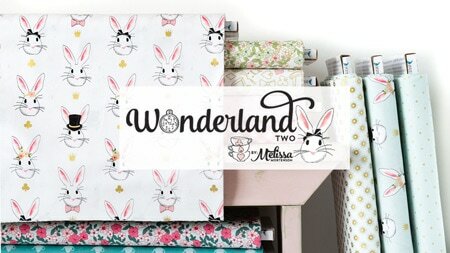 This is a really cute project! I think I will use felt for the white postage borders so I don’t have to worry about fraying! Thank you so much for sharing this tutorial with us. I have seen many stamps on instagram and never really knew what I could do with them. 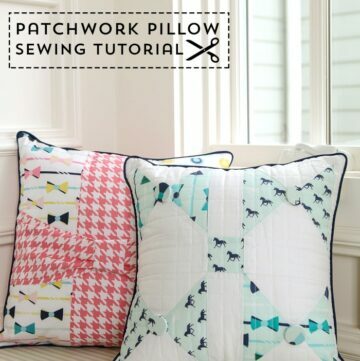 Your cushion tutorial is the perfect answer! Thank you again! 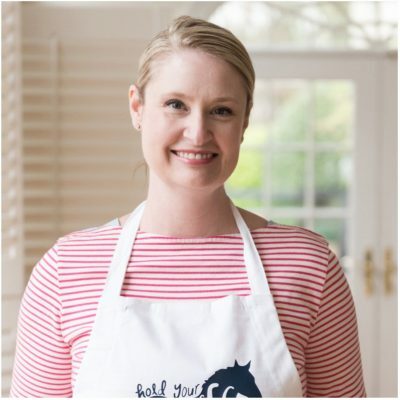 Your project is completely adorable! 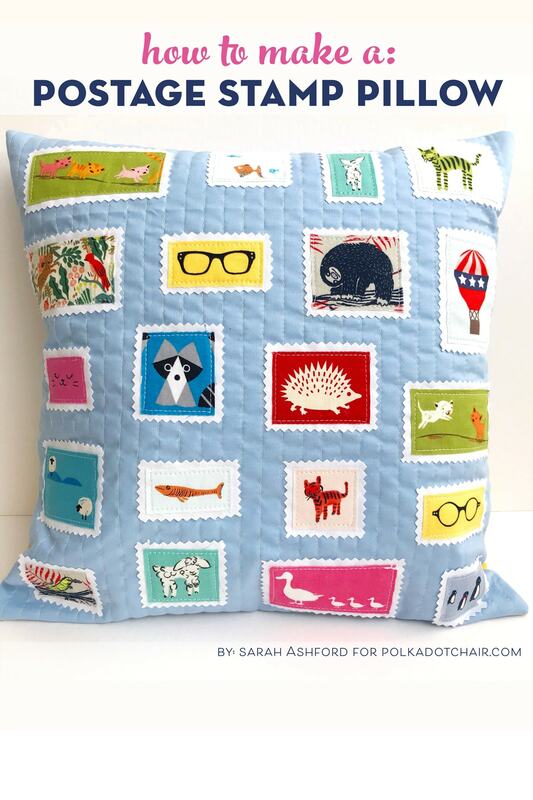 My daughter collects stamps and would LOVE a pillow like this. Thank you for sharing your process.